I know what you’re thinking. I’m too busy to make oatmeal on the stove top. Why would I make it there when I can zap it in the microwave for 60 or so seconds? The answer is because it tastes so much better. And it doesn’t take too-too long to make stove top oatmeal. I can usually do it in about 10 or 15 minutes, and that’s not even dedicated time. I cook mine low and slow so I can do a little multitasking, prepping for the day and what not. I’ll prep everything and then pack my purse, give the oatmeal a stir, gather my water bottle, etc. I guess the question is…Do you have 10 or 15 minutes you can dedicate towards treating yourself to home cooked deliciousness? A quick note on sweeteners. I like a light drizzle of honey in this. I think honey goes perfectly with blueberries. If you’re vegan you can sub maple syrup. Just a wee bit should do it. Blueberries can range from pretty sweet to pretty tart. Maybe taste test yours before deciding how much sweetener to add to your batch? Either way, you’re eating a better sweetener (and probably less of it) than you would in oatmeal packets. Oatmeal packets are fine and all. They’re better than getting fast food when you’re in a pinch. But, I love treating myself to from-scratch, stove top oatmeal. It’s such an easy way to elevate your first meal of the day. Also, my inner hippie has been avoiding the microwave whenever possible. If I haven’t convinced you yet, picture this. You just mix a bunch of ingredients in one pot, turn the heat on low, stir it every once in awhile, and then eat it when it’s reached the texture you like. Pour it in a bowl, add some fun (and healthy!) toppings. Boom. Healthy breakfast achieved. Maybe I should make a video? Would that be interesting? I did shoot a video for another upcoming recipe, so that will be a first try. You’ll have to let me know what you think of it. Frozen: I like to keep frozen blueberries on hand most times. So when I haven’t been to the grocery store in awhile, I can still whip this up. I’ll almost always have the oatmeal in the pantry and blueberries in the freezer. Fresh: Sometimes I’ll have a big container of blueberries, and I’m looking for ways to use them. This is a really easy way because you can grab a handful and toss them into the oatmeal. Either way, you’ll get a nice fruit serving first thing! Elevate your first meal of the day with a simple Blueberry Oatmeal recipe for stove top oatmeal. 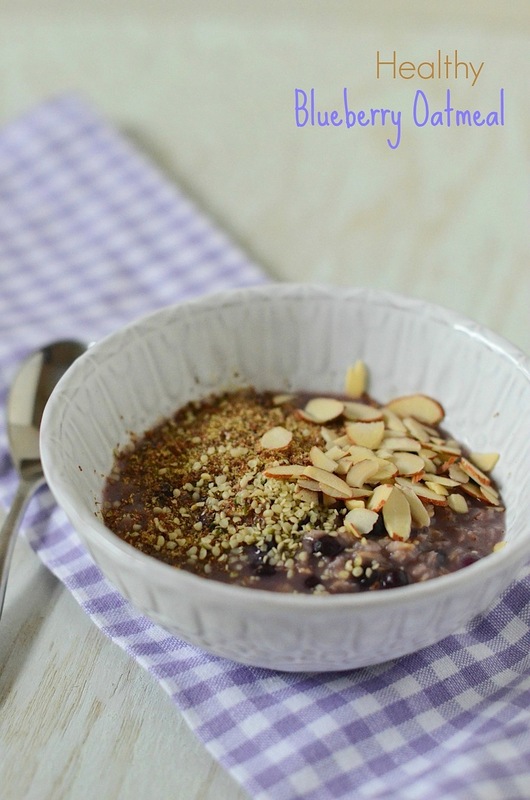 In a small non-stick pot, combine oats, rice milk, water, blueberries, chia seeds, and salt. Stir ingredients together until well combined. 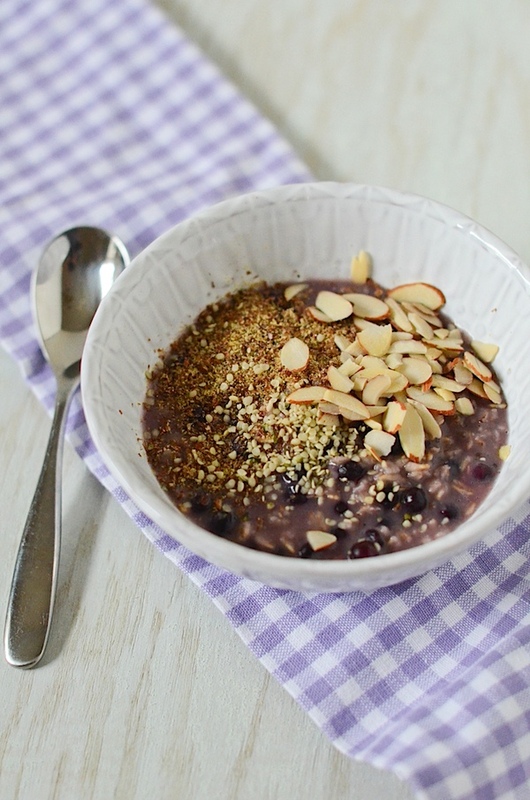 Turn heat to medium low and cook, stirring occasionally, until the blueberry oatmeal reaches your desired texture, approximately 8-12 minutes (depending on your preference). Stir in honey. Serve and top with toppings of choice. Enjoy! Note: You can use fresh or frozen blueberries. Note: You can add the blueberries at any time. If my blueberries are frozen, I like to add them at the beginning of cooking. If they’re fresh, I will sometimes hold them till the oatmeal is just done to keep the blueberries intact. If you add them sooner, they may cook into the oatmeal, which you may prefer. The latter does give the oatmeal a pretty purple-ish color. Be sure to add some healthy toppings. I like to add some nuts on top to keep me fuller longer. 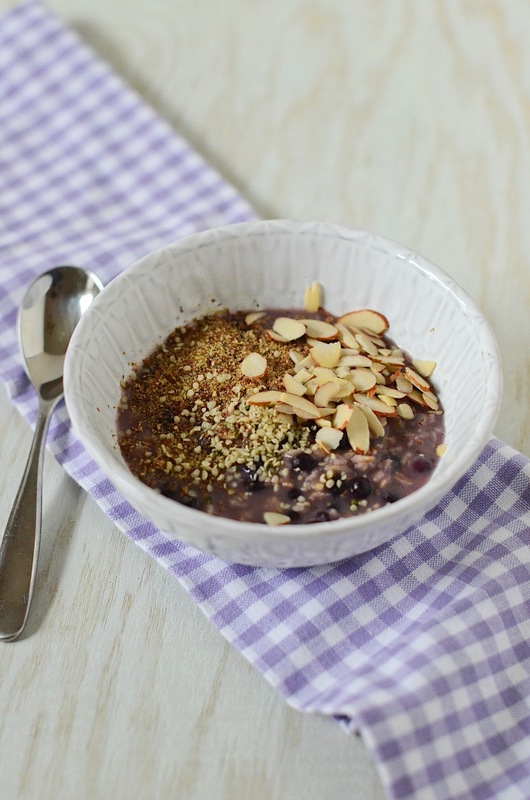 On top of this bowl, we have sliced almonds, ground flaxseed, and hemp seeds. Toppings are a great way to add even more nutrients and vitamins to your oats.